‘Environment’ being one of the favourite areas for UPSC, it is necessary to analyse the details of recent hot topics or controversies. Gadgil report and Kasturirangan report related with the Western Ghats hence deserves much attention for UPSC Prelims, Mains and Interview. This post is longer than most of our previous articles but read till the end to get your basics right. Also, there are comments on a lighter note. No offence intended. This article performs the cumbersome background digging operation™ into the controversial Madhav Gadgil committee and Kasturirangan committee reports and our only aim is to reduce the workload of UPSC aspirants. Please note that this is not a research paper. 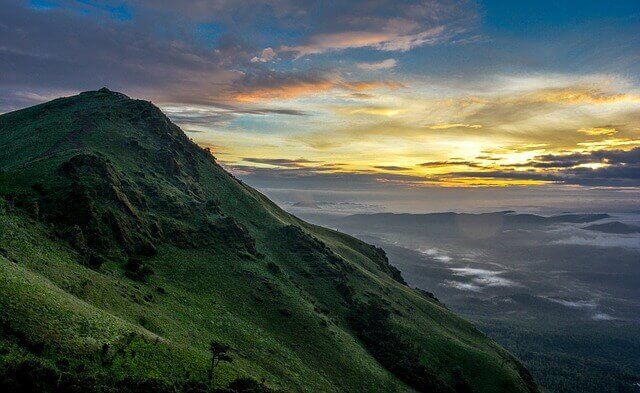 The Western Ghats is an extensive region spanning over six States, 44 districts and 142 taluks. It is the home of many endangered plants and animals. Western Ghats host India’s richest wilderness in 13 national parks and several sanctuaries. Recognised by UNESCO as one of the world’s eight most important biodiversity hotspots, these forested hills are also sourcing to numerous rivers, including the Godavari, Krishna and Cauvery. The Western Ghats acts as a huge water tank supplying water to six states. Now there are many leakages and there is a water shortage. All the rivers are running dry now. And wherever there is water, it is highly polluted. The Western Ghats needs high attention in the sustainability aspect of whole India and especially South India. Ministry of Environment and Forests of India set up in March 2010 an expert panel (Gadgil commission) to find a strategy for conserving these Ghats. Gadgil Commission, an environmental research commission is named after its chairman Madhav Gadgil. The commission is formally known as Western Ghats Ecology Expert Panel (WGEEP). The commission submitted the report to the Government of India on 31 August 2011. Gadgil committee had eminent ecologists and their report too reflected that. The report was labelled favourable to environment and environmentalists and not development (or illegal mining 🙂 ). Remember, there is a never-ending debate between environment and development; it’s tough to balance both without compromising the other. Anyway, let’s come back to Gadgil Report highlights. The Western Ghats Ecology Expert Panel (WGEEP) designated the entire hill range as an Ecologically Sensitive Area (ESA). The panel, in its report, has classified the 142 taluks in the Western Ghats boundary into Ecologically Sensitive Zones (ESZ) 1, 2 and 3. ESZ-1 being of high priority, almost all developmental activities (mining, thermal power plants etc) were restricted in it. Gadgil report recommended that “no new dams based on large-scale storage be permitted in Ecologically Sensitive Zone 1. Since both the Athirappilly of Kerala and Gundia of Karnataka hydel project sites fall in Ecologically Sensitive Zone 1, these projects should not be accorded environmental clearance,” it said. Gadgil Committee report specifies that the present system of governance of the environment should be changed. It asked for a bottom to top approach (right from Gram sabhas) rather than a top to bottom approach. It also asked for decentralization and more powers to local authorities. The commission recommended constitution of a Western Ghats Ecology Authority (WGEA), as a statutory authority under the Ministry of Environment and Forests, with the powers under Section 3 of the Environment (Protection) Act, 1986. Ministry of environment and forests kept the Gadgil report in safe custody for eight months with them. It was not available for public discussion as expected by Gadgil committee members. People asked for a copy, but the ministry said it could not be given. When an RTI petition was filed, it was not given. Then the matter is taken to the Delhi high court and only when the court passed an order, the ministry released the report! The court ordered that all the reports should be put on websites. Now it’s there in the ministry website and for those who want to read the 522-page report, the link for the same is here – Report. As many mafias created fear among the people that the Gadgil report is anti-farmer and anti-people, people burnt the Gadgil Committee report and the effigy of the well-known environmentalist, Madhav Gadgil. The problem was that most people had not read it. (Who bothers to read a 522-page report, that too in English, uh! ;-) ). So, the mining lobby took advantage of this aspect and misled the people. They convinced the people against the report in their favour. The lobby told the people that the report was against farmers and they would have to leave the area. People got really worried. And it is in this background that another committee was appointed to study Gadgil Report, review and suggest measures for implementation. The name of the committee was Kasturirangan committee. (PS: When you finish the 522 page Gadgil Report, you can read the Kasturirangan report here 🙂 ). Instead of the total area of Western Ghats, only 37% (i.e. 60,000 sq. km.) of the total area be brought under ESA under Kasturirangan report. A complete ban on mining, quarrying and sand mining in ESA. Distinguished between cultural (58% occupied in the Western Ghats by it like human settlements, agricultural fields and plantations) and natural landscape (90% of it should come under ESA according to the committee). Current mining areas in the ESA should be phased out within the next five years, or at the time of expiry of mining lease, whichever is earlier. No thermal power be allowed and hydropower projects are allowed only after detailed study. Red industries i.e. which are highly polluting be strictly banned in these areas. Kasturirangan report on the Western Ghats has made several pro-farmer recommendations, including the exclusion of inhabited regions and plantations from the purview of ecologically sensitive areas (ESAs). The Kasturirangan report had said 123 villages fall under the ESA purview. Whenever we study environment, the evergreen topic of debate is between environment and development. It is tough to achieve a perfect balance. The same happened with both these reports. If Gadgil report laid too much importance to the environment, Kasturirangan report was biased towards development. Kasturi Rangan report was criticized by many as that it provided loopholes for mining, which if allowed would turn detrimental to the environment, in long-term will affect development too. Kasturirangan report got the tag as anti-environmental soon after its release. But this report was tagged anti-development too by many who fear that their livelihood and interests will be affected. Gadgil’s Western Ghats (Western Ghats landscape across 1,29,037 sq km.) is smaller than that of Kasturirangan’s (Western Ghats landscape, according to Kasturirangan is 1,64,280 sq km). Gadgil report marked out 60 percent of the Western Ghats as the highest-priority Ecologically Sensitive Zone (ESZ -1). Kasturirangan report marks only 37 percent area (but considers wider Western Ghat boundaries) as ESA. Gadgil’s report proposed to declare this entire landscape as ESA, creating three ESZs within it. He prescribed that the existing sanctuaries and ESZ-1 would together cover 60 percent of this landscape. The 25 percent lowest priority areas would be marked as ESZ-3 to allow all developmental activities with precautions. The remaining 15 percent area would become ESZ-2. For example, while no mining would be allowed within ESZ- 1, existing mines could continue in ESZ-2 with a moratorium on new licences. In ESZ-3, new mines could come up. The Kasturirangan panel, on the other hand, adopted the criteria followed by the Western Ghats Development Programme of the Planning Commission and identified 188 talukas as its Western Ghats landscape, which worked out to 1,64,280 sq km. He marked 37 percent of this stretch as ESA where hazardous industries, thermal plants or mines would not be allowed. 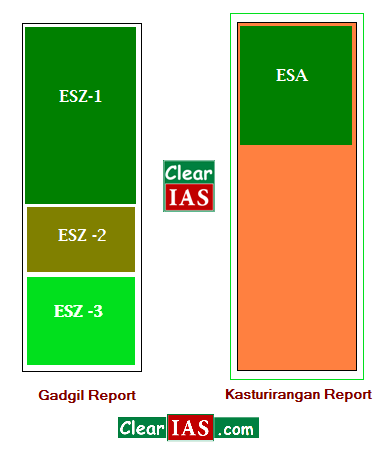 In effect, the restriction level of Kasturirangan’s ESA corresponds to that of Gadgil’s ESZ-1. Now, according to the Gadgil report, the ESZ-1 areas add up to approximately 77,000 sq km (60 percent of 1,29,037 sq km). Kasturirangan’s ESA, on the other hand, accounts for around 60,000 sq km (37 percent of 1,64,280 sq km). That is a reduction of 17,000 sq km in the top priority segment. (Source : Western Ghats – Tehelka). Another committee to study Kasturi Rangan report! Oh ! Please, No! Yes, Oommen V Oommen Committee : As people turned violent and started protests, Oommen Chandy, the then Chief Minister of Kerala set up an expert committee (the chairman has same first name as CM, did you see that; though he made life of UPSC aspirants difficult by appointing another committee, he made things a little easy by selecting a chairman whose first name is same as his, so that UPSC aspirants can remember: To the notice of all future committees and commissions! 😉 ). The expert committee, appointed by the Kerala government, to study the Kasturirangan report in detail submitted its report to chief minister Oommen Chandy (CM). The committee recommended the government to make changes in the clauses of Environmentally Fragile Land (EFL) in the Western Ghats. The Oommen Committee reported that serious lapses happened in determining the EFL areas. The committee adopted a satellite survey to determine EFL and even plantations and estates were included in it! It also recommended stopping land acquisition proceedings according to the Kasturirangan committee report. The panel has made several pro-farmer recommendations, including the exclusion of inhabited regions and plantations from the purview of ecologically sensitive areas (ESAs). The Kasturirangan report had said 123 villages fall under the ESA purview. The state-level panel said a field survey should be held in places that the Madhav Gadgil and Kasturirangan reports have identified as ESAs to demarcate forest land and human settlements. After examining the population density of these areas, human settlements should be exempted from the category of ESAs. It also said farmers should not be stopped from rearing hybrid varieties of milking animals and suggested that the grace period is given to shift to organic farming be extended from five years to 10 years. The report said forest areas should be fenced to prevent the animals straying into it. No, not after the 3rd committee! But even before that! Farmers were worried of Gadgil report, fearing their eviction. They fear the same of Kasturirangan report too. 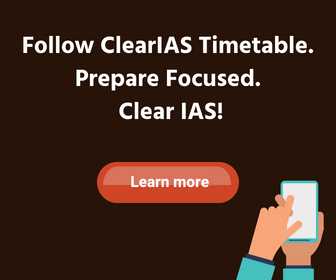 By this time UPSC aspirants should have realised that no report can satisfy all! Though there are many who treat Kasturirangan report as a more practical report, the truth is that Gadgil report was not anti-farmer. Also, people had misconceptions about Ecologically Fragile Lands (EFL) and Ecologically Sensitive Areas (ESA). 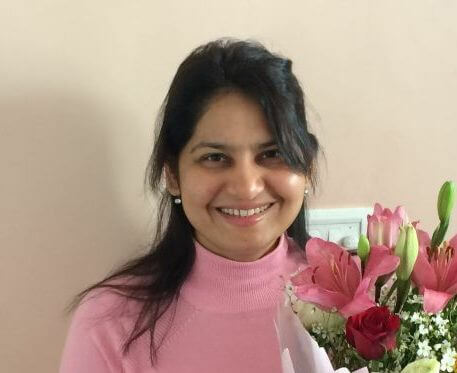 Both of them were different concepts under different laws–the first under forest department and the latter under the district administration and pollution control board. And remember that protests often are not due to love towards the environment, but often because of fear of eviction or loss of livelihood. Centre issued an office order in November 2013 directing immediate implementation of five proposals in the Kasturirangan report. This was the immediate provocation for the agitation. Later, the central government sought the opinion of the five states in implementing the report. Dialogues were still on and the government had asked the state governments to submit their views on the report. The Kasturirangan panel had submitted its report to the Ministry on April 15, 2013. (Finally) it was put in public domain and also disseminated to all stakeholders including the six Western Ghats states including Gujarat, Karnataka, Maharashtra, Goa, Kerala and Tamil Nadu for feedback and comments. Going with the recommendations of the high-level panel that was headed by Mr. Kasturirangan, the Ministry has decided to declare the ESA over 37% of the Western Ghats under the Environment Protection Act, 1986. With the central government deciding to implement the Kasturirangan Committee report on the Western Ghats, there were several protests in Kerala. 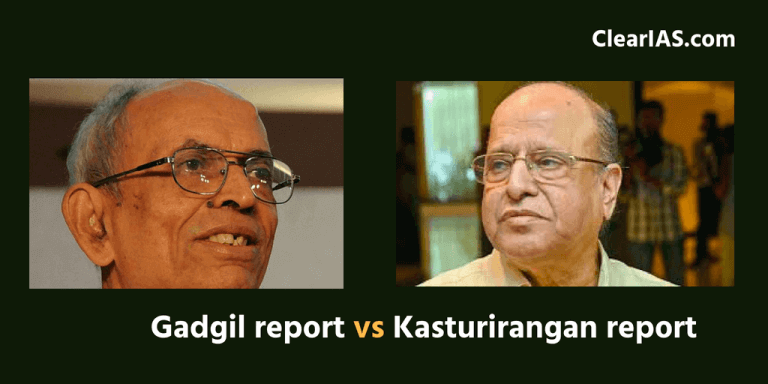 Even those who opposed the Gadgil Committee report now want it in place of the Kasturirangan Committee report. People now fear that due to illegal mining they would get evicted indirectly. Going against the recommendation of the Environment Secretary, the Minister retained the criteria to leave areas with high-density of the population out of this regulated zone’s ambit. The high-level panel had recommended that the hill tracts with high population densities be kept out of the ESA ambit. The MoEF recently came out with the order, and according to directions under Section 5 of the Environment (Protection) Act, 1986, bars mining in ecologically fragile areas (EFA not to be confused with ESA), setting up of thermal plants and restricts buildings to less than 20,000 sq ft in 123 villages mentioned in the K. Kasturirangan report of the state. Update 2018: As Kerala faces its worst floods in several decades, Madhav Gadgil, the author of a landmark report on the conservation of the Western Ghats created said that Kerala Floods are partly man-made. He said the scale of the disaster would have been smaller had the state government and local authorities followed environmental laws. “Yes, there is an intense rainfall event which has caused this. But I am quite convinced that the last several years’ developments in the state have materially compromised its ability to deal with events like this and greatly increased the magnitude of the suffering that we are seeing today. Had proper steps been taken, the scale of the disaster would have been nowhere near what it is today,” says Dr. Gadgil. This statement has again brought the debate – development vs environment – back into the mainstream. As you all know, the need of the hour is sustainable development. Excellent comparison of these reports. Due to these confusions between these two reports provided here are really suffered by people like me who stays in these said ESA . please just don’t mislead the people for cheap political earnings and for mafia support. The people who stays in those areas are directly feared of their livelihood. Thinking of ecology and environment please don’t forget about the people over these area. There is a place called Phobjika in Bhutan. This is a beautiful valley and home to certain migratory birds especially the black-necked crane. So a black-necked crane conservation center was started under the Royal Society for Protection of Nature(RSPN). They educated the people of the valley the importance of black-necked crane and also the importance of nature and environment. The government also protects these areas from human settlements. In fact, there is a limit set here and humans are not supposed to cross that limit. Guess what, the number of cranes is increasing year by year. In India, our respect for rivers, mountains, etc are limited to prayers and slogans. Here the committee has not asked people to move away from these areas. Even all species have same living rights like us so please coaprate to conserve our last bit of our breathing land rather than opposing it……..
why should people have higher rights than animals?.. This mentality is what wrong with us. The reports were inadequate. Environmentalists want their domain to be predominant while politicians and industry voice diametrically opposite view. Ground realities are dismal and the hills are slowly becoming unlivable. In another decade or so, Western Ghats are going to be devoid of forests and water and that will deprive the entire population of their livelihood. Since it is type of slow death, nobody will realise it. Unfortunate!! sir this article please available in Hindi medium. Loss of livelihood changes the people lifestyle & creates fear about the future. Not only by implementing the reports but also floods that they loss his lives. In my point of view, Adapt to kasturi rangan committee report with gadgil’s bottom to top approach more feasible and good. sustainable methods should be adopted. livelihoods should never be a problem for environmental degradation. Good analysis and approach sir ! Please keep up the good work. Thank you again. The need of the hour is protection of ecologically sensitive areas from the mafias, i think these report will not effect the livelihoods especially gadgil report, but what the govt did that, instead of giving clarity about awareness and importance to the implementation of these reports govt. Tried to hide it’s facts from the peoples.